Advanced Vision Care is the most trusted name in the field of vision correction and is distinguished with various accolades as the leading vision correction centre in the world. Our surgeons are pioneers in the field of ophthalmology and have the latest technology available at their disposal. Our clinic is based in Harley Street in the heart of London – just a stone’s throw away from Buckingham Palace. We have a reputation for providing bespoke vision correction services for our patients and we are one of the oldest and most trusted eye clinics in the world. AVC provides the latest Laser eye surgery and non-laser treatments for vision correction; although we make sure that we provide tried and tested vision correction treatments which have proven statistical data and real life examples. We also independent – we are not affiliated with one medical equipment or lens manufacturer so that we can provide tailor made service completely personalised to your requirements. Recently, Advanced Vision Care has redesigned our website. Our Medical Director, Dr Pillai, says “we felt the need to provide our clients with a web platform where our patients are able to reach the information they are looking for with ease and minimum effort”. 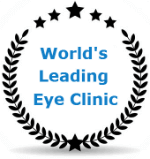 We are the leader in the vision correction industry. AVC have set the standard in the industry by providing Intralase and Advanced Wavefront as standard for Laser Eye Surgery which makes this procedure very precise, blade free and extremely safe. Other clinics shy away from providing Intralase and Advanced Wavefront as standard as they don’t have the state of the art medical equipment that AVC has. Our non-laser treatments are no exception. We are also highly recommended by a range of leading health insurance companies. AVC’s cutting edge technology is favoured by NHS consultant surgeons due to its accessibility, the latest Alcon cataract suite and highly trained excellent nursing staff who have attained the highest qualifications in their field. AVC is a forward thinking company and our mission is to provide the very latest vision correction services which are miles ahead of other clinics – not just in the UK but unmatched by any other in the world. Our website is a reflection of our mission and strives to provide honest information so that our clients are able to take that life changing step in their lives to correct their vision with ultimate confidence. We hope that our patients find our website a great source of information through their vision correction journey to enjoy 20/20 vision.